Do fishes think? Do they really have three-second memories? And can they recognize the humans who peer back at them from above the surface of the water? 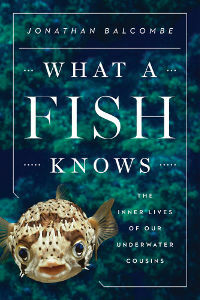 In What a Fish Knows, the myth-busting ethologist Jonathan Balcombe addresses these questions and more, taking us under the sea, through streams and estuaries, and to the other side of the aquarium glass to reveal the surprising capabilities of fishes. Although there are more than thirty thousand species of fish―more than all mammals, birds, reptiles, and amphibians combined―we rarely consider how individual fishes think, feel, and behave. This morning, still recovering from jetlag, I went for a bike ride as the sun rose on the suburbs north of Washington, DC. As I cycled through one of the lovely state parks that grace my neighborhood, I spooked a small herd of deer enjoying some browse at the border of a woodland and field. At first I thought they were accompanied by a domestic dog, until I realized I had seen a piebald white-tailed deer. A recent article by British scientist and author Matt Ridley denies rats the capacity for empathy primarily on the flimsy basis that studies on ants show them helping a distressed fellow ant. As it seems “absurd” to attribute empathic suffering to a social insect, we should not stoop to crediting such feelings to rats either, according to Ridley, and the authors of a recent paper in Biology Letters. For the record, I have great respect for ants, and I won’t jump to conclusions about their capacities. But why on earth would we use ants as a yardstick for the emotional capacities of rats—a species with a demonstrated capacity for laughter, pessimism, emotional fever, and metacognition (awareness of one’s own knowledge)? It’s a Sunday morning and I’m sitting on my deck in the outer suburbs of Washington, D.C., which abuts a magnificent woodland plot. In the winter one can just see through the naked trees to a field 500 feet beyond. But in summer this space is transformed into a lush green world. Regardless of the season it throngs with life, but it seems that summer days are the busiest. I have the added good fortune of having neighbors who ply the wildlife with a smorgasbord of bird and mammal feeders, so it sometimes looks like rush-hour at Grand Central Station. This morning I’ve been out here for an hour and as usual there are plenty of little stories unraveling. This morning as I went to fetch the paper from the front porch of my town-home in suburban Maryland, a neighbor took her dog across the parking area to a central green-space for a morning bathroom break. I’ve seen this mid-sized, thickly furred canine on her morning ablutions before. Usually it’s the man of the house who is on the other end of the retractable leash, but in either case, there’s a sense of rush-hour haste to the operation. These folks clearly have jobs to get to and the AM dog shift is all business—I only hope the evening walk is less perfunctory. This morning I went grocery shopping at my local Whole Foods market. Whole Foods is the largest natural foods supermarket chain in the world. I consider people who shop here to be relatively enlightened. I saw at least six people wearing coats with real fur trim collars. Fur Fact: the fur industry has staged something of a come-back since it reached its low point in the mid-nineties. Yesterday as I stepped from the train on my way to a Bach concert, I noticed a house sparrow lying prostrate on the platform next to a rain shelter. No doubt she had flown into the shelter’s window. Hoping she was just stunned, I picked her up. Alas, she was quite dead. I stroked the soft feathers on her neck and head, noted the robustness of her pink beak, and admired the perfect symmetry of her tail feathers before depositing her beneath some ground ivy, where ants, flies and other members of nature’s recycling crew might perform their services undisturbed. House sparrows are commonplace in the United States, and Washington, D.C. is no exception. They lurk in my neighborhood, chirping from eaves, taking shelter beneath cars, and holding noisy palavers inside cedar trees. If a picture is worth a thousand words, then a video is worth a thousand pictures. One of the rewards of being a passionate animal observer in this day and age is the proliferation of video clips that circulate on YouTube and Facebook. These authentic segments of animal lives provide precious glimpses of their emotions, and they often belie common prejudices about animals and nature. For centuries we believed that humans were the only ones that mattered. 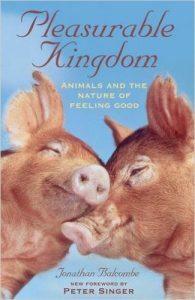 The idea that animals had feelings was either dismissed or considered heresy. Today, that’s all changing. New scientific studies of animal behavior reveal perceptions, intelligences, awareness and social skills that would have been deemed fantasy a generation ago. The implications make our troubled relationship to animals one of the most pressing moral issues of our time. The recognition of animal pain and stress, once controversial, is now acknowledged by legislation in many countries, but there is no formal recognition of animals’ ability to feel pleasure. 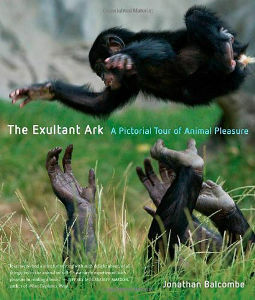 Pleasurable Kingdom is the first book for lay-readers to present new evidence that animals – like humans – enjoy themselves. 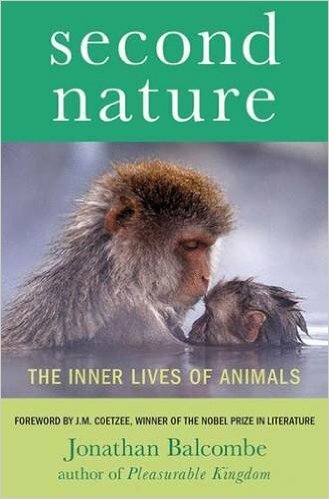 This book presents a comprehensive examination from an ethical and humane perspective of the use of animals in education. 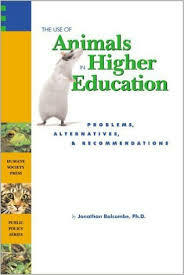 The book covers animal use in all levels of education from middle school to advanced veterinary and medical training; however,emphasis is on those grades in which animal use is greatest in the secondary and undergraduate levels.